Good morning from Page, Arizona. And welcome to the Navajoland. Shall we continue our journey here :)? Page is indeed a beautiful city. I am glad my hubby insisted on staying here as our gateway to the Grand Canyon. So many interesting spots to see and enjoy. Before that, we have considered other cities as well, including those closer to Grand Canyon or on our way to Death Valley. 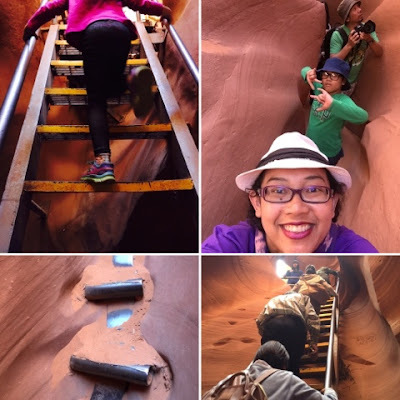 As I have shared before in Spring Break 2016: the Quest of the Horseshoe Bend and the Missing Antelope, we spent a half day taking the Lower Antelope Canyon tour. 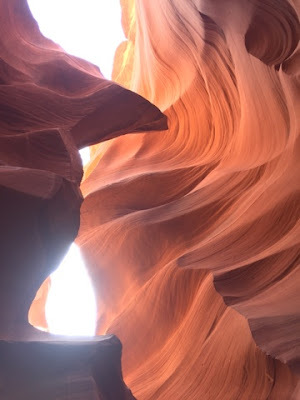 It takes around 30 minutes drive to Lower Antelope Canyon from our hotel at Best Western Plus Lake Powell, Page. 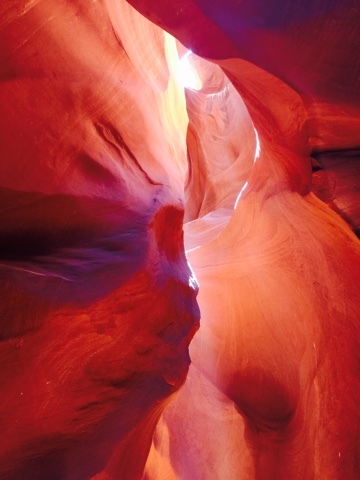 The typical landscape of the area is desert, but underneath is another world indeed. Never crossed our minds that beautiful, one-of-a-kind rocks constellation is waiting down there. So early morning, we went to the Lower Antelope Canyon. There are two tour operators here and we chose Ken's tour. I read in Trip Advisor that they are well recommended. It's also better if you reserve before coming in. They assigned a group of approximately 15-20 people every 15 minutes. And the list is filled up fast. We came at 9.15 but got a slot for 10 AM. 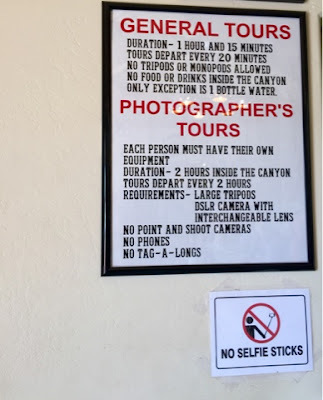 There are 2 types of tours, genera one and the photographer one. We took the general one because the photographer tour filled up already. Unless we wanted to come back later that day. There are a few things we have to consider before chosing those tours, as you can see in my picture below. The fee is $20 per adult, and kids 7 years and older is $12. while waiting for the tour..
For sure you can not take a self-guided tour here. 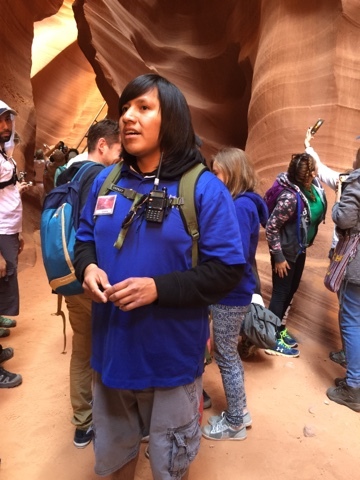 We were wondering about that and once we were at Lower Antelope Canyon we know why we have to take the guided tour. 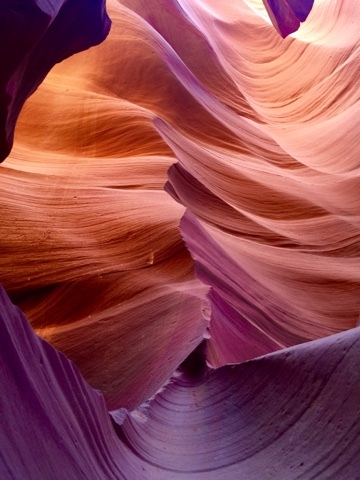 This canyon is amazingly located underneath the ground. You have to take stairs, many of them. Some of them are very steep. But no need to worry as it is indeed safe to do so. 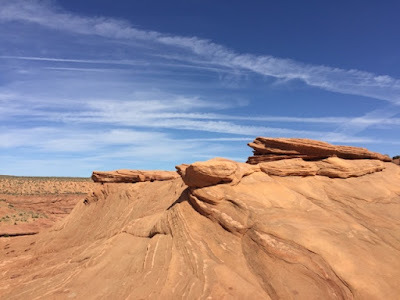 Take it as a little effort we have to make before we can witness the fantastic sandstones, curves, turns and magically curved and sculptured by the wind and water for thousands of years. Not to mention that this area was recently flooded. Therefore, it's rather dangerous for you to go down there alone or with someone who is not familiar with the area. Our tour guide, John, was very nice and patience as well. 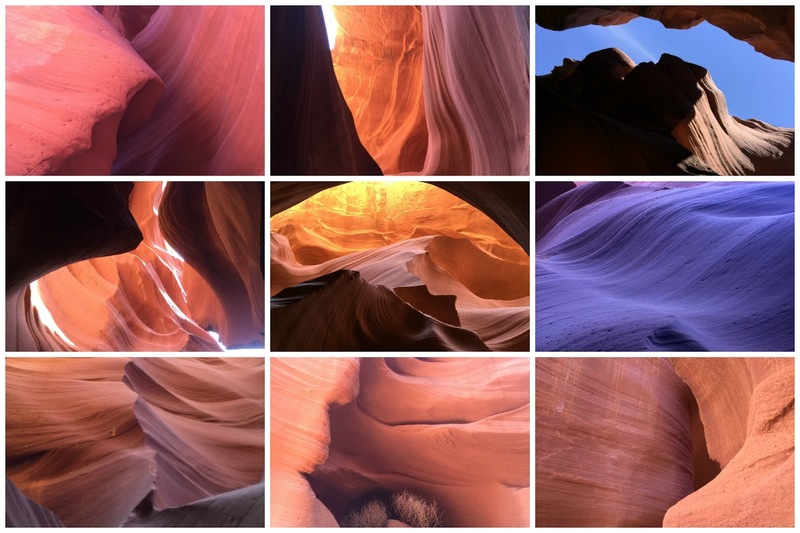 He explained a lot about the story of the canyon and the names of the rocks. We saw the lion's head, the lady, the Indian chief.. Complete with his headdress. And soooo many other incredible shapes, forms and colors. Here are some more photos in a collage. I have tons of them but I know it will be too heavy for the blog :). 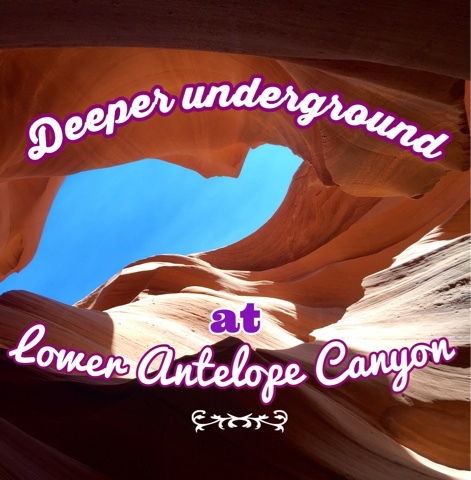 So when you happen to be in Page or the neighborhood, don't miss the Lower Antelope Canyon. Truly a great experience for us, and for you as well. Tempatnya memang keren ya mba... Alhamdulillaaah dapat kesempatan main ke sini.. Truly incredible what our world has to offer! 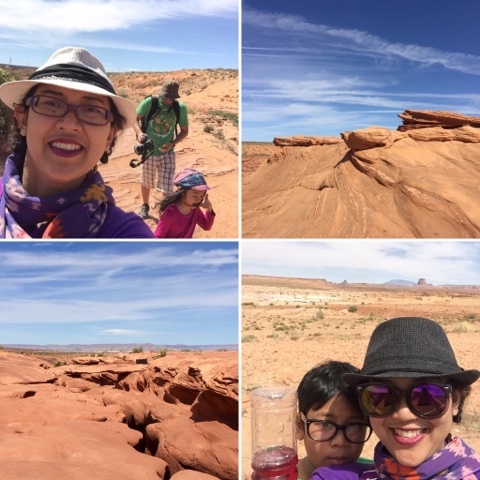 Thank you for sharing these amazing snaps! iya mbaaa Tanty..alhamdulillah bisa melihatnya..
Allah menunjukkan betapa besar kuasaNya. Iya, kan. Bunda seneng banget liat wajah indah yang sehat, ceria daaan cantik banget. salam dr INA.